600 pages | 193 B/W Illus. 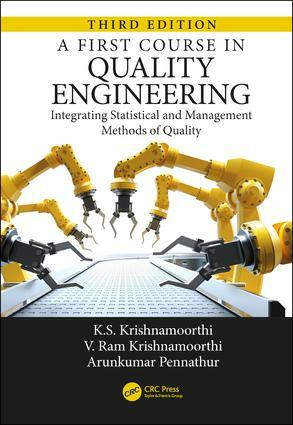 This book is the leader among the new generation of text books on quality that follow the systems approach to creating quality in products and services; the earlier generations focused solely on parts of the system such as statistical methods, process control, and management philosophy. It follows the premise that the body of knowledge and tools documented by quality professionals and researchers, when employed in designing, creating and delivering the product will lead to product quality, customer satisfaction and reduced waste. The tools employed at the different stages of the product creation cycle are covered in this book using real world examples along with their theoretical bases, strengths and weaknesses. This textbook can be used for training - from shop floor personnel to college majors in business and engineering to practicing professionals. Graduate students training as researchers in the quality field will also find useful material. The book has been used as the text for a Professional Series Massive Open Online Course offered by the Technical University of Munich on edX.org, through which tens of thousands of participants from all over the world have received training in quality methods. According to Professor Dr. Holly Ott, who chose the book for the course, the text is one of the main factors contributing to success of this MOOC. The Third Edition has been fully revised to be friendly for self-study, reflects changes in the standards referenced such as ISO 9000, and includes new examples of application of statistical tools in health care industry. Preface. Introduction to Quality. Statistics for Quality. Quality in Design. Quality in Production: Process Control – I. Quality in Production – Process Control II. Managing for Quality. Quality in Procurement. Continuous Improvement of Quality. A System for Quality. Appendix: Statistical Tables. Answers to Selected Exercises. Index. K.S. Krishnamoorthi, PhD, is a professor of industrial engineering in the industrial and manufacturing engineering and technology department of Bradley University in Peoria, Illinois. He has a BE degree in mechanical engineering from the University of Madras, India, an MA in statistics and a PhD in industrial engineering from the University of Buffalo. He teaches statistics and quality engineering, among other industrial engineering subjects, and conducts research in the area of quality costs, process capability indices, and statistical thinking. He has provided consultation to several small and large corporations in process and product quality improvement using statistical tools. V. Ram Krishnamoorthi, MD, MPH, is an attending internist at the University of Chicago Medical Center and an assistant professor of medicine at University Chicago, Chicago, Illinois. He obtained his bachelor’s degree in economics from Princeton University, and his MD and MPH from Northwestern University Feinberg School of Medicine in Chicago. He is involved in health services research and quality improvement initiatives at the U of Chicago Hospitals, and is interested in problems of quality and access to affordable healthcare at the national level. Arunkumar Pennathur, PhD, is an associate professor of instruction in the industrial engineering program at the University of Iowa in Iowa City. He holds a BE degree in mechanical engineering from the University of Madras, India, an MS degree in industrial engineering from Bradley University, Peoria, Illinois, and a PhD in industrial engineering from the University of Cincinnati. Dr. Pennathur has taught courses in process engineering, quality control, design of experiments, operations research, tooling engineering, systems engineering, and human factors. His research in sociotechnical systems engineering, human factors, and engineering education have been funded by the National Science Foundation, the National Institutes of Health, the US Army Research Laboratory, and a host of industry sponsors. Dr. Pennathur has been the Editor-in-Chief of International Journal of Industrial Engineering, and has served on numerous editorial boards. He has authored/co-authored over 150 publications including 2 edited books on industrial productivity and enhancing resource effectiveness.